George Axe was born in East Chinnock in 1866, the eldest son of agricultural labourer Edwin Axe (1842-1913) and Catherine née Pike (also known as Chant, 1844-1896). In the 1871 census Edwin and Catherine were living in Chinnock Street, East Chinnock with 5-year old George and his 2-year old sister Rose. By 1881 the family had moved to West Street, East Chinnock and the family had increased with the births of Frank (b1873), Henry (b1874), Samson (b1876) and Mary (b1878). 15-year old George gave his profession as a Baker's Assistant. By the time of the 1891 census George had moved to Colyton, Devon, where he was lodging with Edward and Sarah Purse in Queen Street. George gave his occupation as Baker's Assistant and was most likely in the employ of Baker & Confectioner Samuel Lock whose premises were just two doors away (even today Colyton isn't big enough to have two bakers!). While living in Colyton, George met and married Mary Richards (1868-1947) of Colyton, daughter of labourer Julian Richards. On his marriage certificate (see below) George gave his occupation as a Baker. Their daughter Lily Mabel, their only child, was born at Colyton in 1894. 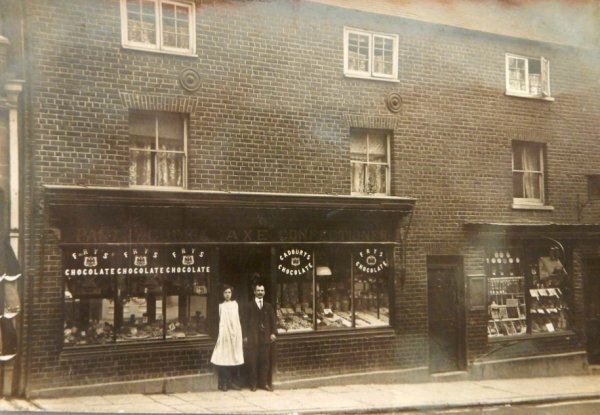 By 1901 George had moved his family to Yeovil where he set up his new bakery and confectionary premises at 22 Middle Street - see photo below. In the census George, listed as aged 31 (actually 36) gave his profession as 'Baker, Confectioner, Shopkeeper'. Living with George, Mary and Lily was a young Baker's Assistant, Charles Moore. The family were still living above the shop premises in 1911 with a domestic servant. George gave his occupation as 'Confectionary (Maker)' and Mary gave her occupation as 'Assisting in Business'. 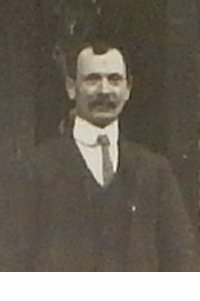 Lily was married in Yeovil in the summer of 1916 to Samuel T Gill (1893-1959). George was listed in very few trade directories despite, or perhaps because of, the prime location of his premises in Middle Street - the only example I found was in Kelly's Directory of 1923 in which he was listed simply as "Axe, George, Confectioner, 22 Middle Street". By the time of their Golden Wedding anniversary in June 1943 George and Mary had retired and were living at 11 Union Street. Mary died in 1947, aged 79. In the late summer of 1959 Lily was widowed and around the same time her father George died on 30 August 1959. George's will was proved the following April and his effects valued at £14,707 7s 6d (about £870,000 at today's value). George and Mary's marriage certificate of 13 June 1893. 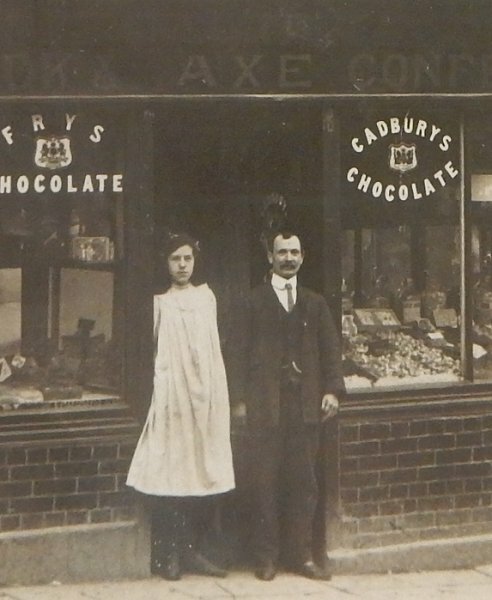 George and his daughter Lily standing by their shop at 22 Middle Street in 1907. At right is the home and shop premises of watch & clock maker Frederick J Hicks at 22a Middle Street. An enlargement of the previous photograph featuring George and Lily. In June 1943 George and Mary celebrated their Golden Wedding Anniversary as reported here in the Western gazette.